I had said several times that Obama is a smart and cultivated man in a social and political system he believes in. He wishes to bring healthcare to nearly 50 million Americans, to rescue the economy from its profound crisis and to improve the US image which has deteriorated as a result of genocidal wars and torture. He neither conceives nor wishes to change his country’s political and economic system; nor could he do it. The Nobel Peace Prize has been awarded to three American presidents, one former president and one candidate to the presidency. The first one was Theodore Roosevelt elected in 1901. He was one of the Rough Riders who landed in Cuba with his riders but with no horses in the wake of the US intervention in 1898 aimed at preventing the independence of our homeland. The second was Thomas Woodrow Wilson who dragged the United States to the first war for the distribution of the world. The extremely severe conditions he imposed on a vanquished Germany, through the Versailles Treaty, set the foundations for the emergence of fascism and the breakout of World War II. The third has been Barack Obama. Carter was the ex-president who received the Nobel Prize a few years after leaving office. He was certainly one of the few presidents of that country who would not order the murder of an adversary, as others did. He returned the Panama Canal, opened the US Interests Section in Havana and prevented large budget deficits as well as the squandering of money to the benefit of the military-industrial complex, as Reagan did. The candidate was Al Gore –when he already was vicepresident. He was the best informed American politician on the dreadful consequences of climate change. As a candidate to the presidency, he was the victim of an electoral fraud and stripped of his victory by W. Bush. The views have been deeply divided with regards to the choice for this award. Many people question ethical concepts or perceive obvious contradictions in the unexpected decision. 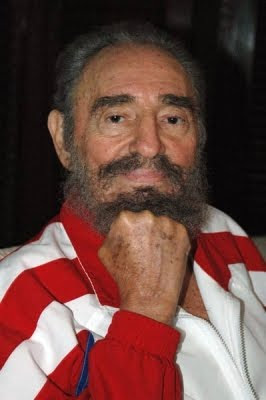 In our press and in CubaDebate, honest revolutionary comrades have expressed their criticism. One of them wrote: “The same week in which Obama was granted the Nobel Peace Prize, the US Senate passed the largest military budget in its history: 626 billion dollars.” Another journalist commented during the TV News: “What has Obama done to deserve that award?” And still another asked: “And what about the Afghan war and the increased number of bombings?” These views are based on reality. I am sure that Obama agrees with Moore’s phrase. He is clever enough to understand the circumstances around this case. He knows he has not earned that award yet. That day in the morning he said that he was under the impression that he did not deserve to be in the company of so many inspiring personalities who have been honored with that prize. It is said that the celebrated committee that assigns the Nobel Peace Prize is made up of five persons who are all members of the Swedish Parliament. A spokesman said it was a unanimous vote. One wonders whether or not the prizewinner was consulted and if such a decision can be made without giving him previous notice. The moral judgment would be different depending on whether or not he had previous knowledge of the Prize’s allocation. The same could be said of those who decided to present it to him. Perhaps it would be worthwhile creating the Nobel Transparency Prize. Bolivia is a country with large oil and gas depots as well as the largest known reserves of lithium, a mineral currently in great demand for the storage and use of energy. Before his sixth birthday, Evo Morales, a very poor native peasant, walked through The Andes with his father tending the llama of his native community. He walked with them for 15 days to the market where they were sold in order to purchase food for the community. In response to a question I asked him about that peculiar experience Evo told me that “he took shelter under the one-thousand stars hotel,” a beautiful way of describing the clear skies on the mountains where telescopes are sometimes placed. In those difficult days of his childhood, the only alternative of the peasants in his community was to cut sugarcane in the Argentinean province of Jujuy, where part of the Aymara community went to work during the harvesting season. Not far from La Higuera, where after being wounded and disarmed Che [Guevara] was murdered on October 9, 1967, Evo –who had been born on the 26th of that same month in the year 1959—was not yet 8 years old. He learned how to read and write in Spanish in a small public school he had to walk to, which was located 3.2 miles away from the one-room shack he shared with his parents and siblings. During his hazardous childhood, Evo would go wherever there was a teacher. It was from his race that he learned three ethical principles: don’t lie, don’t steal and don’t be weak. At the age of 13, his father allowed him to move to San Pedro de Oruro to study his senior high school. One of his biographers has related that he did better in Geography, History and Philosophy than in Physics and Mathematics. The most important thing is that, in order to pay for school, Evo woke up a two in the morning to work as a baker, a construction worker or any other physical job. He attended school in the afternoon. His classmates admired him and helped him. From his early childhood he learned how to play wind instruments and even was a trumpet player in a prestigious band in Oruro. As a teenager he organized and was the captain of his community’s soccer team. But, access to the University was beyond reach for a poor Aymara native. After completing his senior high school, he did military service and then returned to his community on the mountain tops. Later, poverty and natural disasters forced the family to migrate to the subtropical area known as El Chapare, where they managed to have a plot of ground. His father passed away in 1983, when he was 23 years old. He worked hard on the ground but he was a born fighter; he organized the workers and created trade unions thus filling up a space unattended by the government. The conditions for a social revolution in Bolivia had been maturing in the past 50 years. The revolution broke out in that country with Victor Paz Estensoro’s Nationalist Revolutionary Movement (MNR, by its Spanish acronym) on April 9, 1952, that is, before the start of our armed struggle. The revolutionary miners defeated the repressive forces and the MNR seized power. The revolutionary objectives in Bolivia were not attained and in 1956, according to some well-informed people, the process started to decline. On January 1st, 1959, the Revolution triumphed in Cuba, and three years later, in January 1962, our homeland was expelled from the OAS. Bolivia abstained from voting. Later, every other government, except Mexico’s, severed relations with Cuba. The divisions in the international revolutionary movement had an impact on Bolivia. Time would have to pass with over 40 years of blockade on Cuba; neoliberalism and its devastating consequences; the Bolivarian Revolution in Venezuela and the ALBA; and above all, Evo and his MAS in Bolivia. It would be hard to try summing up his rich history in a few pages. 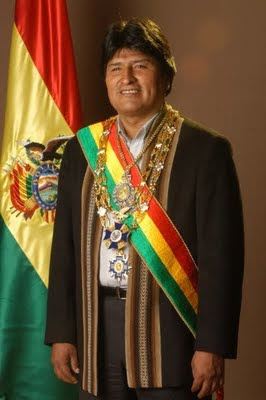 I shall only say that Evo has prevailed over the wicked and slanderous imperialist campaigns, its coups and interference in the internal affairs of that country and defended Bolivia’s sovereignty and the right of its thousand-year-old people to have their traditions respected. “Coca is not cocaine,” he blurted out to the largest marihuana producer and drug consumer in the world, whose market has sustained the organized crime that is taking thousands of lives in Mexico every year. Two of the countries where the Yankee troops and their military bases are stationed are the largest drug producers on the planet.